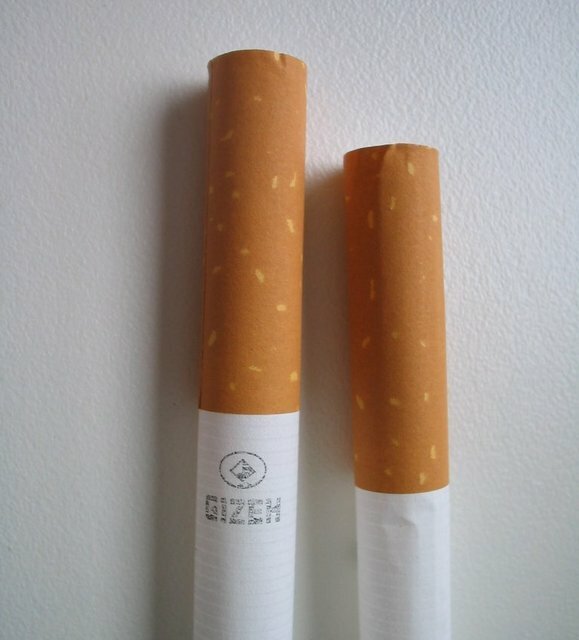 The new ('08) Gizeh Silver Tip Extra has a 25mm long filter, is made in France and has offset seams. Because of the longer filter, you will get the best results when using the Extra handheld, the new TOM or any 'matic with 59mm or shorter spoon (using some kind of opening reducer is also a good idea). If stuffing leaves a bit of a void, these are prone to crumpling because the tipping paper doesn't extend past the filter. My favorite premium tube since the Rizla Cigarette Size (NLA in the US). Gizeh America was kind enough to send me a box of the Extras and the handheld designed for them. I've made very few cigarettes with a handheld so all I can say is that it looks like a modified Silver Tip Boy. It has the shorter chamber and spoon needed when stuffing the Extras. I've been using Rizla Cigarette size tubes for a couple years now and the Extras are comparable in all respects. Long filters don't affect the taste/strength of the tobacco as much as one would think, but I like them. While the taste is a bit smoother to me, its also about the reduced quantity of tobacco. Even with a 25mm filter, there's more than enough tobacco for me. Because of their reduced diameter, the 22mm filtered cig size tubes hold ~3% less tobacco than the Extras. The Extra box advertises a "10% Reduced Filing Area", but it looks to me like the Extras hold 14.5% less tobacco than tubes with 15mm filters. An interesting difference between the cig size and Extra is that the tipping paper on the Extras only extends about 3/16" or 5mm past the filter. The tipping paper on the cig sized tube extends past the filter the same amount as on tubes with 15mm filters. The extended tipping paper may help if you get filter end voids and need to do a lot of tapping. If you get a good fill off the machine, it doesn't matter. I habitually two tap every cigarette and didn't have a single tube accordion up on me. After I took the picture I realized that the tipping paper on the 25mm filtered Zen 100's is only a tad longer than on the Extras. I just got the Silver tip extra tubes and the ST Extra Injector in the mail today. the 25mm filter doesn't seem to make it a light tube (thank god, I don't care for light tubes really) I just stuffed the first one with Penhooker light to see if it makes it lighter or not and thankfully it doesn't. very solid build and thin paper too. it does seem to be a tad smoother as far as tounge bite goes, thats why I used PenHooker light first, PH Lt is one of my fav lights but you sure dont want to draw it too hard too fast. All in all a very nice tube, I'll be buying more. Looks like they would be the perfect tube to use for the most tongue bite prone tobacco. Sounds like this tube is standard diameter. Has anyone tried then on an Excel (blue) machine? Curious to know if the spoon length is a good match for this tube. I'm big on flush tipped smokes and the TOM (with handle) is the only machine that can do that (with any long filtered tube) out of the box. All other machines will need a shortened spoon. The Excel spoon is a mere 2mm shorter than the Supermatic spoon (67 VS 69mm) and nowhere near 59mm.